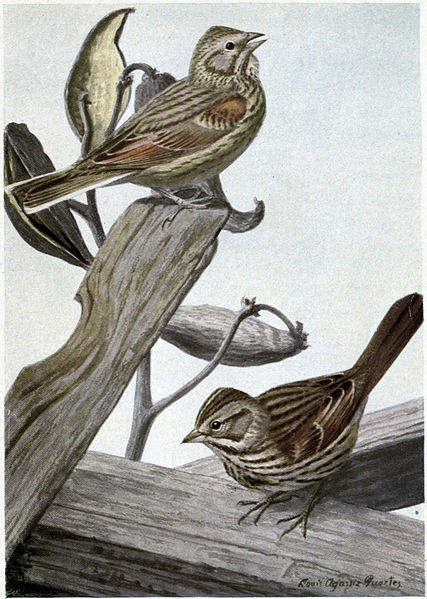 The Song, White-throated and Fox Sparrows. CHAPTER 3. Jenny Has a Good Word for Some Sparrows. The song was coming from quite the other side of the Old Orchard from where Bully and Mrs. Bully had set up housekeeping. Peter hurried over. He found Mr. Wren right away, but at first saw nothing of Jenny. He was just about to ask after her when he caught sight of her with a tiny stick in her bill. She snapped her sharp little eyes at him, but for once her tongue was still. You see, she couldn’t talk and carry that stick at the same time. Peter watched her and saw her disappear in a little hole in a big branch of one of the old apple-trees. Hardly had she popped in than she popped out again. This time her mouth was free, and so was her tongue. “You’d better stop singing and help me,” she said to Mr. Wren sharply. Mr. Wren obediently stopped singing and began to hunt for a tiny little twig such as Jenny had taken into that hole. Peter grinned and looked a little foolish, but he didn’t resent it. You see he was quite used to that sort of thing. “Aren’t you afraid that Bully will try to drive you out of that house?” he ventured. Jenny Wren’s sharp little eyes snapped more than ever. “I’d like to see him try!” said she. “That doorway’s too small for him to get more than his head in. And if he tries putting his head in while I’m inside, I’ll peck his eyes out! She said this so fiercely that Peter laughed right out. “I really believe you would,” said he. “I certainly would,” she retorted. “Now I can’t stop to talk to you, Peter Rabbit, because I’m too busy. Mr. Wren, you ought to know that that stick is too big.” Jenny snatched it out of Mr. Wren’s mouth and dropped it on the ground, while Mr. Wren meekly went to hunt for another. Jenny joined him, and as Peter watched them he understood why Jenny is so often spoken of as a feathered busybody. For some time Peter Rabbit watched Jenny and Mr. Wren carry sticks and straws into that little hole until it seemed to him they were trying to fill the whole inside of the tree. Just watching them made Peter positively tired. 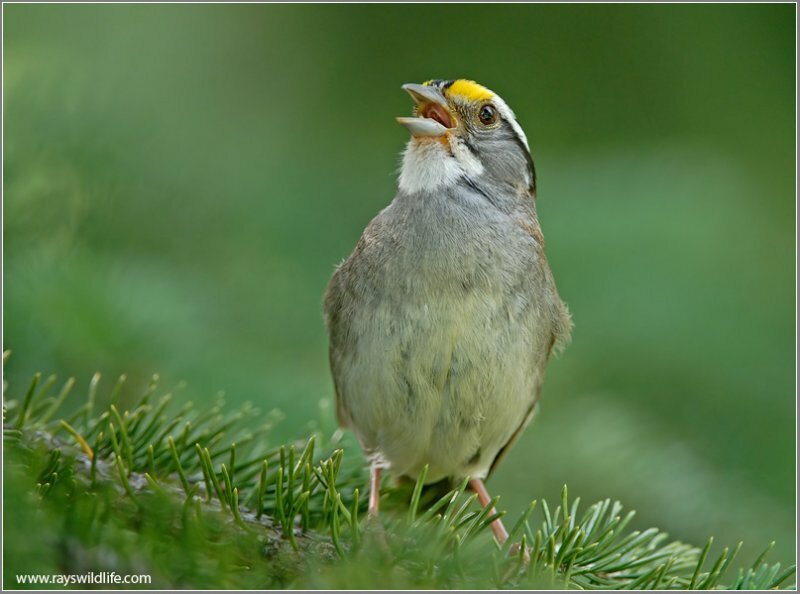 Mr. Wren would stop every now and then to sing, but Jenny didn’t waste a minute. In spite of that she managed to talk just the same. 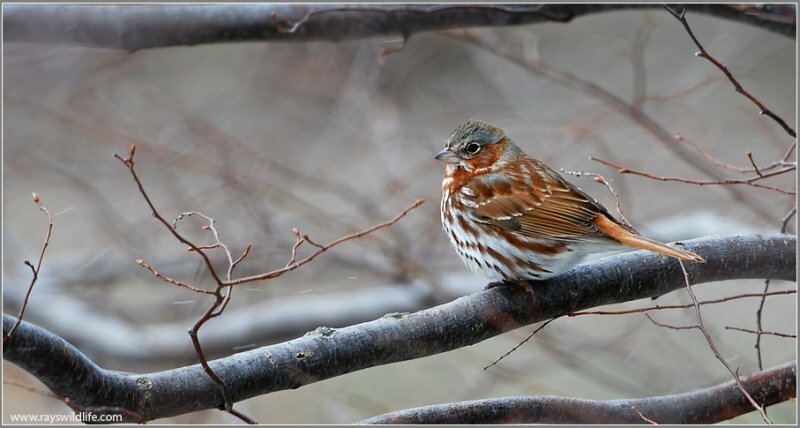 “I suppose Little Friend the Song Sparrow got here some time ago,” said she. “Speaking of the sparrow family, did you see anything of Whitethroat?” asked Jenny Wren, as she rested for a moment in the doorway of her new house and looked down at Peter Rabbit. “What?” demanded Jenny rather sharply. Jenny seems to be in a kinder mood in this chapter. She has kind words about three different Sparrows. Can you name them? What kind of sparrow was Little Friend? What kind of songs does he sing? Where does he like to live? What color cap does he have? Our second sparrow is pictured at the top. Where was Whitethroat headed? What color is his cap? What does his song sound like? (When people use word to descrbe a song, that is called – Mnemonics. 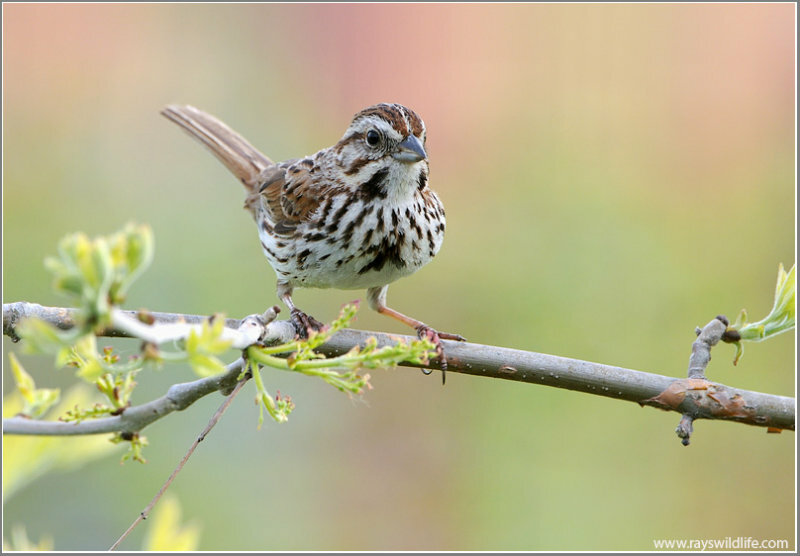 Who is the largest sparrow? What color is Scratcher’s coat? Why is he called “Scratcher”? Jenny is using nice words about the sparrows this time. Don’t you like to have good words spoken about you? Do you use nice words when talking about someone? Read the two verses and think about how the Lord wants your speech. Next Chapter – Chippy, Sweetvoice, and Dotty. This entry was posted in Birds, Birdwatching, From The Past and tagged Birdwatching Tips, Burgess Bird Book For Children, Christian, Friendly, Home School, Kids, Kind Words, Nature, Sparrows, Youth. Bookmark the permalink.